Beautiful certificate from the Historical Register Publishing Company issued in 1894. This historic document was printed by Wm. F. Murhpy and Sons and has an ornate border around it. This item has the signatures of the Company's V. President, H.H. Bellas and Treasurer, George Cuthbert Gillespie and is over 113 years old. 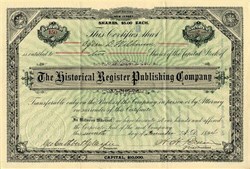 Historical Register Publishing Company published The American Historical Register and Monthly Gazette of the Patriotic-Hereditary Societies of the Unites States of America.